Q. How do we get our Christmas tree at Patchen. A. It’s really easy. You just walk around in the fresh mountain air until you see the perfect one for your living room and cut it down. If you need help finding it, cutting it, carrying it, putting it in or on top of your car. We can do all of that for you. Your job is to have fun. Q. What kind of trees do you have? A. We grow mostly Monterey Pine, Douglas Fir and Sierra Redwoods. The pines are the long needle ones that smell really good. The short needle Douglas Fir are the traditional trees that we remember from childhood. The Redwoods are the slightly bluefish colored ones that look so perfectly shaped. Q. Do you have Nobles? A. Noble and the other “true firs” are native to much colder climates and don’t grow very well in these mountains. So we have them shipped in from Oregon. We have a large selection of Nobles and others. Q. What are the trees that have the sparse branches that stick straight out? A. Those are the California Red Fir, known as the “Silvertip”. Like the White Fir, Noble Fir, Fraser Fir and the many other “true firs”, they don’t thrive in this climate but we do have precut ones from Northern California. Q. Do you have Scotch pine? A. Scotch Pine grow mostly in the eastern part of the country but we have Monterey Pine, which looks very similar and smells great. Q. We are on a tight budget; what are the best price trees? A. Some prices are discounted $5 on weekdays! We also pay the sales tax for those paying cash. We happily accept competitors’ discount coupons up to $5 or 10%. Finally, if you are willing to drive further into the mountains and compromise on the quality we will be happy to direct you to farms with lower prices. Q. How long does it take for a tree to grow? A. An eight foot tree is usually 6 to 10 years old. Some species grow faster and the time depends greatly on how well the trees are cared for. Q. Why do you leave all of those branches on the stump when the tree is cut? A. We ask everyone to leave at least 5 or 6 branches, each bigger than a finger. That is enough to keep the stump alive so that it can grow a new tree in a few years. Some of these stumps have produced as many as 7 trees and are still prospering. Q. Do we need to bring a saw or can we bring our chainsaw? A. We have saws for you. Our insurance will not permit customers to use their chainsaws. However, we will be happy to cut your tree and carry it down the hill for you. Q. Do we need to call before coming? A. No, come anytime. We are open from 7 am till 7 pm, 7 days a week from the Saturday before Thanksgiving through Christmas Eve. Q. What if we get home and realize that we have lost a glove, camera, keys, etc. at Patchen? A. 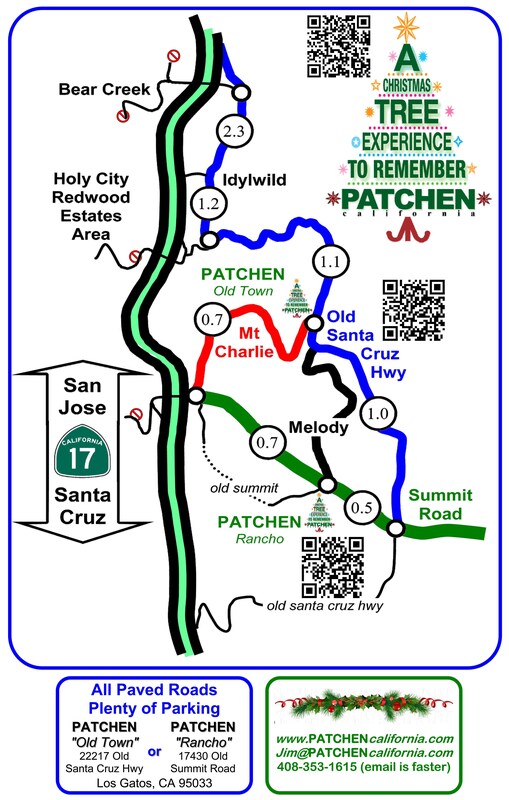 Just send an email Jim@PatchenCaliformia.com (quicker & easier than phone) explaining what you lost and where you think it might be, and we will send someone out to look for it.